Over the past year, jobless rates increased in 49 states as national unemployment rose to 6.7%. Are you more likely to buy a car from GM or Chrysler after Friday's bailout? NEW YORK (CNNMoney.com) -- Unemployment rates rose in 37 states and the District of Columbia in November as the recession hammered nearly every job sector, according to a government report released Friday. The Bureau of Labor Statistics release said five states reported decreases in unemployment, while eight states saw no change. The national unemployment rate rose to 6.7% from 6.5% the previous month and from 4.7% in November 2007. Over the past year, jobless rates were up in 49 states and the District of Columbia, the report said. Unemployment was unchanged in West Virginia. "One clear takeaway is that this recession is incredibly broad-based," said Mark Vitner, senior economist at Wachovia Corp. (WB, Fortune 500) "Nearly every industry, almost every region was slammed. The year-to-year decline is sizable, and very few states are seeing growth." Michigan had the highest monthly unemployment rate in November, at 9.6%, the report said. That state, home to the Big Three car manufacturers, has struggled under the weight of the companies' collapsing finances - though President George Bush announced a Detroit rescue plan Friday. 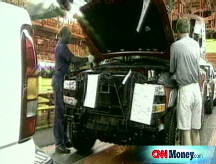 Both General Motors (GM, Fortune 500) and Chrysler have idled plants and laid off thousands of employees. Rhode Island posted the second-highest monthly unemployment rate, at 9.3%, according to the report. California and South Carolina each reported 8.4%. Oregon, a manufacturing state, reported the largest month-over-month unemployment rate increase, rising to 8.1% from 7.2%, the report said. Florida lost the most jobs, 58,600, followed by North Carolina (46,000) and California (41,700). Florida and California's numbers were likely exacerbated by the housing market collapse. Nonfarm payroll employment rates rose in 9 states and fell in 41 states and D.C., the department said. The largest month-over-month job gains were in Washington (17,400), where 27,000 aerospace workers ended their strike and returned to the payrolls. Texas added 7,300 jobs, and Oklahoma was third with 3,000 new jobs. Alaska saw the largest month-over-month percentage gain in employment (up 0.8%), followed by Washington (up 0.6%), and Hawaii, North Dakota, and Oklahoma (which each saw an increase of 0.2%). It's unlikely that the employment picture will improve any time soon. "The first half of 2009 is going to be very tough, and [keep in mind that] unemployment rates continue to rise for about a year after a recession ends," Vitner noted. He added that although healthcare is one sector that "seems to be holding up relatively well, many hospitals are experiencing funding difficulties of their own." The energy sector was also comparatively stable, but with oil prices in "free fall," Vitner said he expected to see a slowdown there as well. He noted construction is the source of many of the job cuts, but he predicted the sector will rebound "because there's only so low the rates can go." "The recession started this time last year," Vitner said. "When you compare these numbers to those from a year ago, it's a bleak but accurate snapshot of how this recession has played out."